The head is wedge-shaped, and in proportion to the body size (length about 40 % at the height at the withers), without being plump or too elongated, dry in the overall appearance and moderately broad between the ears. Seen from the front and side, the forehead is only slightly arched and without any or with only a slightly indicated middle furrow. The German Shepherd Dog has erect ears of medium size, which are carried upright and aligned (not drawn-in laterally); they are pointed and with the auricle facing forward. Tipped ears and drooping ears are faulty. Ears carried rearward when moving or in relaxed position are not faulty. The neck should be strong, well-muscled and without loose neck skin (dewlap). The angulation towards the trunk (horizontal) amounts to approx. 45 %. The upper line runs from the base of the neck via the high, long withers and via the straight back towards the slightly sloping croup, without visible interruption. The back is moderately long, firm, strong and well-muscled. The loin is broad, short, strongly developed and well-muscled. The croup should be long and slightly sloping (approx 23° to the horizontal) and the upper line should merge into the base of the tail without interruption. The chest should be moderately broad, the lower chest as long and pronounced as possible. The depth of the chest should amount to approx. 45 % to 48 % of the height at the withers. The ribs should feature a moderate curvature; a barrel-shaped chest is just as faulty as flat ribs. The forelimbs are straight when seen from all sides, and absolutely parallel when seen from the front. Shoulder blade and upper arm are of equal length, and firmly attached to the trunk by means of powerful musculature. The angulation from shoulder blade and upper arm is ideally 90°, but generally up to 110°. The elbows may not be turned out either while standing or moving, and also not pushed in. The forearms are straight when seen from all sides, and absolutely parallel to each other, dry and firmly muscled. The pastern has a length of approx. 1/3 of the forearm, and has an angle of approx. 20° to 22° to the forearm. A slanted pastern (more than 22°) as well as a steep pastern (less than 20°) impairs the suitability for work, particularly the stamina. The paws are rounded, well-closed and arched; the soles are hard, but not brittle. The nails are strong and of dark colour. 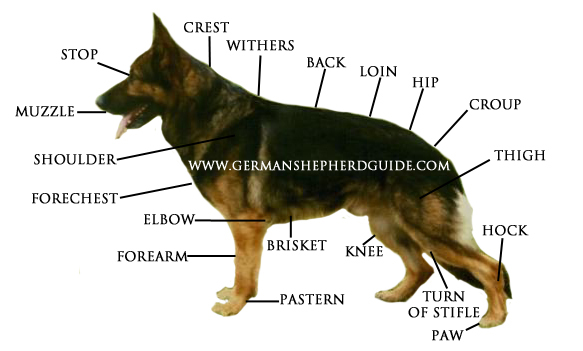 The German Shepherd Dog is a trotter. The limbs must be coordinated in length and angulation so that the dog can shift the hindquarters towards the trunk without any essential change of the top line and can reach just as far with the forelimbs. Any tendency towards over-angulation of the hindquarters reduces the stability and the stamina, and thereby the working ability. Correct body proportions and angulations results in a gait that is far-reaching and flat over the ground which conveys the impression of effortless forward movements. The head pushed forward and the slightly raised tail result in a consistent, smooth trot showing a gently curved, uninterrupted upper line from the ear tips over the neck and back to the end of the tail. The skin is (loosely) fitting, but without forming any folds. The German Shepherd Dog is bred in the hair varieties double coat and long and harsh outer coat – both with undercoat. Colours are black with reddish-brown, brown and yellow to light grey markings; single-coloured black, grey with darker shading, black saddle and mask. Unobtrusive, small white marks on chest as well as very light colour on insides are permissible, but not desirable. The tip of the nose must be black in all colours. Dogs with lack of mask, light to piercing eye colour, as well as with light to whitish markings on the chest and the insides, pale nails and red tip of tail are considered to be lacking in pigmentation. The undercoat shows a light greyish tone. The colour white is not allowed. Any deviation from the aforementioned points should be considered as a fault whose evaluation should be in exact proportion to the degree of deviation. Dogs with weak character and weak nerves which bite. Dogs with proven “severe hip dysplasia”. Monorchid or cryptorchid dogs as well as dogs with clearly dissimilar or atrophied testicles. Dogs with disfiguring ears or tail faults. Deviations from the above-described breed characteristics which impair the working capability. Ears set too low laterally, tipped ears, inward constricted ears, ears not firm. Overshot by 2 mm and more. Level bite in the entire incisor region.